We couldn't have breakfast bentos without having lunch bentos. Of course, since it is a 2 day trip, we can really only have bentos on the first day. We do stop in Nashville to visit family, so day two will involve an extra lunch stop. However, the Nashville-Dallas leg is a much easier drive than Buffalo-Nashville, so we can take a chance at stopping in Arkansas for lunch. For yesterday's lunch, Ben has a corned beef and cheddar sandwich on this really yummy bread my mom buys. 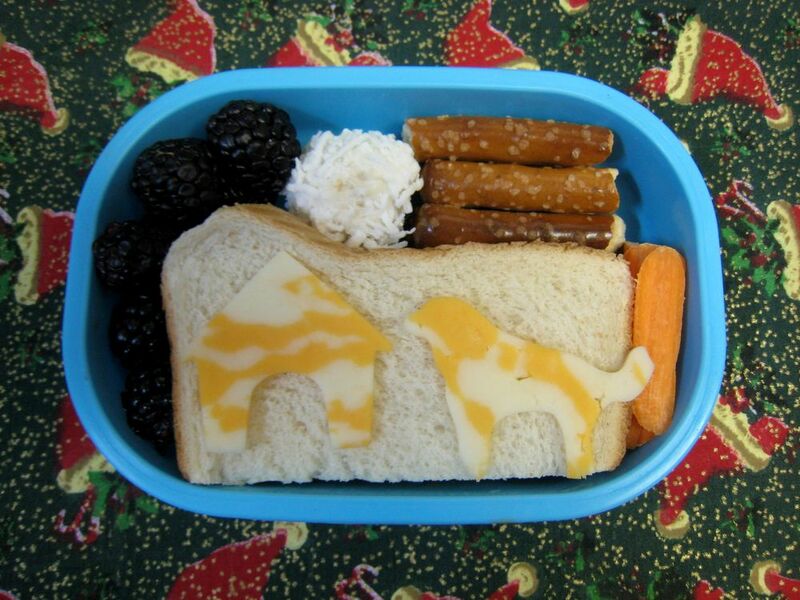 In honor of the Canadian collies, it's decorated with a cheese dog and doghouse. Ben has carrot sticks, blackberries, pretzels, and one of the snowball Christmas cookies, covered in coconut. Again, all fairly non-messy foods that are easy to eat in the car. Hope you had a nice stop in AR, my home state!